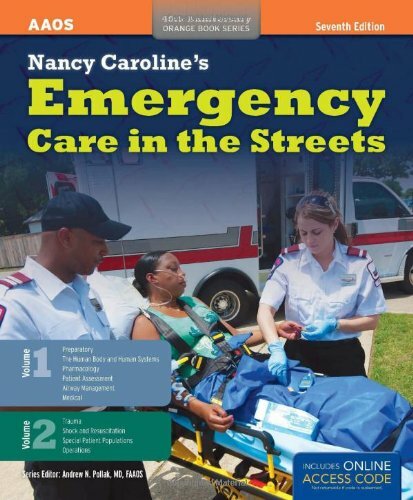 1449645860 -Nancy Caroline’s Emergency Care in the Streets, Seventh Edition is the next step in the evolution of the premier paramedic education program. This legendary paramedic textbook was first developed by Dr. Nancy Caroline in the early 1970s and transformed paramedic education. Today, the American Academy of Orthopaedic Surgeons is proud to continue this legacy and set the new gold standard for the paramedics of tomorrow. The Seventh Edition reflects the collective experience of its top-flight author team and decades of street wisdom. This fully updated edition covers every competency statement of the National EMS Education Standards for paramedics with clarity and precision in a concise format that ensures student comprehension and encourages critical thinking. This edition emphasizes the ideal that becoming a paramedic is a continual pursuit of growth and excellence throughout an entire career. Concepts of team leadership and professionalism are woven throughout the chapters, challenging students to become more compassionate, conscientious health care professionals as well as superior clinicians.